A new paper in Nature this week presents results from an ice core drilled by the British Antarctic Survey (BAS) at James Ross Island on the Antarctic Peninsula. Before discussing the results, congratulations are due to Rob Mulvaney and his team for obtaining the ice core in the first place, quite apart from the analyses. James Ross Island is a gorgeous place to work on a sunny summer day, but it can be brutal on a bad day, and the BAS team spent many months in the field. 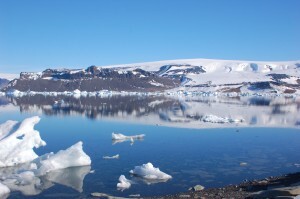 The record they obtained is some 50,000 years long — by far the longest record ever obtained on the Antarctic Peninsula. (James Ross Island’s ice cap was originally cored by a Argentine/French team back in the 1980s, but they obtained just a 400 year record). Figure 1.The glaciated summit of Mt. Haddington, site of a new ice core record reported by Mulvaney et al., as viewed from Santa Marta Cove, James Ross Island, on a nice summer day. (photo: E. Steig). So do Mulvaney et al.’s results allow us to discern signal from noise? The short answer is yes, but it’s not that simple. This is quite apparent from the reporting on the paper, most of which has been pretty accurate, yet with headlines running the gamut from saying that the cause of recent warning is “unclear” (NPR) or “part of longer trend” (Australian Broadcasting Corp.), to “most warming in Antarctic is human caused” (Climate Central) and a more subdued “ususual but not unique” from the BBC. Why the ambiguity? After all, the results show that it’s now warmer on James Ross Island now than it has been at any time during at least the last millennium (see Figure 2), and its unequivocal that this recent warmth led to the demise of ice shelves in the area over the last few decades. Moreover, the rate of recent century-scale warming is at the upper limit of rates in the pre-anthropogenic era: Mulvaney et al. find that the most recent warming is faster than 99.7% of any other given 100-year period in the last 2000 years. Why then, doesn’t this lead simply to the conclusion that this that recent warming and associated ice shelf collapse and glacier acceleration on the Antartic Pensinula is the result of human activities? Well, as we’ve noted on many previous occasions, attribution of climate change to specific causes is not simply a matter of looking at whether a particular year or decade is “exceptional” or not. Mulvaney and coauthors have been careful, both in their paper and in interviews about it, to avoid the suggestion that their results are any sort of “smoking gun” pointing towards an anthropogenic cause of the recent warming trend on the Antarctica Peninsula. As I tried to make clear in my News&Views commentary that accompanies their paper, I largely agree. Century scale warming trends comparable to that of the last century have happened before, without any influence from humans, and if we didn’t have any data other than this one ice core, we really couldn’t say much more than that. What’s missing from this argument, of course, is that we do have other data. For one thing, recent rapid warming in Antarctica isn’t limited to the Peninsula. Whatever you may have read in some quarters, the borehole temperature data from WAIS Divide show definitively that West Antarctica is warming too — and in recent decades at least, the rate has been comparable to that on the Peninsula. More importantly, warming is occurring on the Peninsula at the same time that most of rest of the planet is warming. 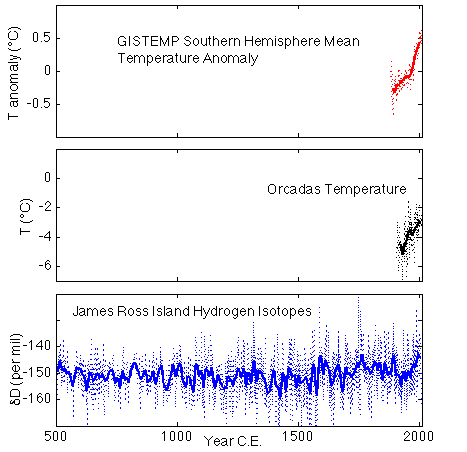 As the figure illustrates, in the Southern Hemisphere that warming has been nearly monotonic since about 1920, whether one is talking about the Southern Hemisphere as a whole (top panel of the figure), at James Ross Island (bottom panel), or at Orcadas in the South Orkney Islands, the one and only location south of 60°S that has a century long instrumental temperature record. This makes it much harder to argue that it is merely “local variability” that explains the recent warming trends. The James Ross Island results thus add yet one more bit of evidence to what we already knew: global warming is.. well, global. Certainly, this is not the last word. A fly in the ointment here is that at least part of the most recent warming trend may be anthropogenic, yet not due to greenhouse gases in the troposphere. As many studies have argued (see e.g. the review by Thompson et al. ), the stratospheric ozone hole has caused changes in the winds around Antarctica, and one of the consequences appears to be advection of warm air from the north onto the Antarctic Peninsula, especially on the east side (where James Ross Island is) during summer. Of course, the ozone hole didn’t exist before the 1970s, so it clearly can’t be invoked for the warming since the 1920s, but any formal attribution study will need to take this, as well as “global warming”, into account. Mulvaney et al.’s paper doesn’t claim to be an attribution study; it’s largely just reporting the data, which is entirely appropriate. And nor am I suggesting that the simple comparison I’ve made above is any sort of formal attribution study either. Only one formal attribution study has been done for Antarctica that I’m aware of — that of Gillett et al., 2008 — and that was before any of the recent results showing warming in West Antarctica, and doesn’t including any of the longer term data from ice cores. What’s needed now is an updated study, taking into account all the available data, including that from ice cores. I would very much like to see someone take this on. Including the new results from James Ross Island will be an important part of such work. Great stuff. I would love to see this in compared to a paleo record of Antarctic frontal positions or ice discharge. I would expect some kind of dynamical response to the reported 20th century warming, even if the mechanism is not straightforward. Such paleo evidence could probably help constrain Antarctic mass loss projections. But please note that the second graph tends to be blocked by Adblock Plus. Also the page (and entire site) looks very narrow on Firefox (with large font for a High-Dpi screen). It looks somehow better in Chrome and IE. Looks fine on my Firefox. Always has. Looks fine, always has. Good article, timely, thanks for getting it up quickly. Fig. 2 is now fixed and all looks fine on a PC Chrome. Why have you only looked at the last 1500 years? Is it possible that the MSM outlets have come to their conclusions by looking at the whole record? Your final observation is interesting – that (anthropogenic) global warming is having an effect on the WAIS despite a cooling trend which would have been expected as a result of stratospheric ozone depletion. Penetration of the Southern Ocean by warmer Pacific and Atlantic currents are of course not affected by the ozone hole but atmospheric warming should be – shouldn’t it? How well accepted is it that (in this region) the spatial slope of the dD-T relationship is representative of the temporal slope (and constant over the Holocene)? This is pretty critical for this sort of study, and I see that the authors justify their assumption somewhat (particularly with the deuterium excess relation) but all my graduate work in the tropics has sort of embedded the philosophy into my head that we don’t understand the controls on isotope variability very well. To be sure, the controls on tropical variability seem to be tied a lot closer to deep convection, rainout upstream, seasonal source changes, etc. I’ not well read in this region of Antarctica though. It could be nice to introduce an isotopic-enabled modeling component into this type of stuff. Regarding Milankovitch forcing, I’m puzzled. There was an overall cooling trend since the early Holocene until the recent reversal. Yet, the precession cycle has been giving the region increasing summer insolation during the period, hasn’t it? What accounts for the observed cooling? I am looking forward to the 50,000 year report. Is there an upper age limit to working in Antarctica? It’s second order causation, but the negative synergy is worth noting. The take by the denial crowd centers on the statement that temperatures were 1.3˚C warmer 11,000 years ago. The implication, I believe, is that the ice didn’t melt then, so it won’t now, and today’s temps are no big deal. My presumption is that just because temperatures on the peninsula were warmer, that doesn’t mean they were uniformly warmer everywhere, in a way that would melt the ice as we’re already seeing today. Another take would be that they are right (to a degree), that a warming of another 1˚C will not melt much of Antarctic ice (although shooting past a total of 2˚C warming would obviously still not be a good idea). Can you elaborate on this? Does the paper explain the differences between then and now? Yes, I guess to some extent it’s a question not of if but how much. I had to revisit the ages of the ice shelves, and certainly it seems that Larsen A and maybe B did melt in that time frame, so I guess the answer is pretty non-controversial, as much as some people seem to think it’s somehow ground-breaking. I can’t find ages for Larsen C, or the larger shelves, like the Ross or Filchner-Ronne. Of course, the answer to that is obvious. Thanks for the post, BTW. Does ANDRILL have cores from under those locations? The sediment will tell whether there was open water (different organisms, different sedimentary layer) as it has for other areas. The sea level signal from Antarctica at 11000 BP would be buried under runoff from the Northern Hemisphere ice sheets. They didn’t disappear until about 6000 BP. It would be good to get some data near the AA peninsula. I can’t find the paper to see what this is about. Does anyone have a link? 11kya – think about the aftermath of the Younger Dryas and changes in the Laurentide ice sheet. What was the global temperature? Here is a commentary with links to other commentaries. Scientific American has lousy commenters. Sphaerica @ 13 & 14 – around 11,000 years ago global sea levels were rapidly rising, but by 8000 years ago had begun to slowly grind to a halt. This work by Mulvaney and c o. is broadly consistent the global sea level trend as indicated by the deglaciation models. re 177 the reason Siberia was not glaciated was that with the lower sea level it was too far inland to get any precipitation. No snow no glaciers. Abstract: The equilibrium solution of a fully coupled general circulation model with present day orbital forcing is compared to the solution of the same model with the orbital forcing from 115.000 years ago. The difference in snow accumulation between these two simulations has a pattern and a magnitude comparable to the ones infered from reconstructions for the last glacial inception. This is a major improvement over previous similar studies, and the increased realism is attributed to the higher spatial resolution in the atmospheric model, which allows for a more accurate representation of the orography of northern Canada and Siberia. The analysis of the atmospheric heat budget reveals that, as postulated by Milankovitch’s hypothesis, the only necessary positive feedback is the snow albedo feedback, which is initiated by reduced melting of snow and sea ice in the summer. However, this positive feedback is almost fully compensated by an increased meridional heat transport in the atmosphere and a reduced concentration of low Arctic clouds. In contrast to similar previous studies the ocean heat transport remains largely unchanged. This stability of the northern North Atlantic circulation is explained by the regulating effect of the freshwater import through the Nares Strait and Northwest Passage, and the spiciness import by the North Atlantic Current. The fact that the realistic difference in snow accumulation is achieved with the same model that is used for the fifth assessment report builds trust in the ability of climate models to anticipate the evolution of climate in the future. DP @22 — Actually not. Consider the two ‘points of accumulation’ of the Laurentide ice sheet to observe how far from the ocean those were. Siberia lacked an ice sheet simply becuase the winds didn’t blow that way.